Fall and winter are amazing times of year for roasting. You can finally welcome your house or kitchen getting warm, rather than finding ways to escape the heat. Roasting is a simple, hands-off way to get amazing flavor from your food and dinner on the table. And it also be an easy way to make more than just chicken or side dishes. I roast vegetables then puree them to make filling, produce-packed soups. My Roasted Squash and Cauliflower Soup is a perfect example of the magic and simplicity of this idea. I roast the vegetables, then add in the broth and any seasonings I like and there’s soup! 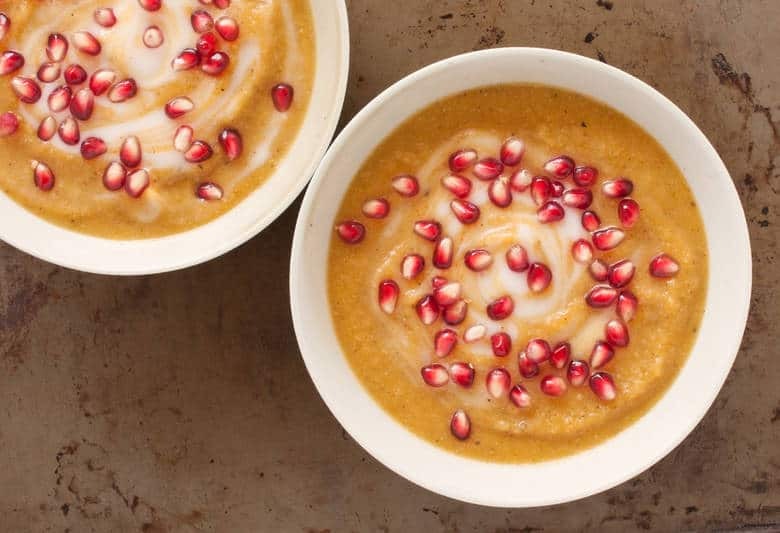 This soup has roasted acorn squash and cauliflower as the star, with an extra bonus of a raw pear to add a bit of sweetness and some added hydration. I’m all about making food that you love and providing options for your tastes and what you’ve got on hand or in your area. You can customize this soup for you in a few ways. Not feeling pears or can’t find one? Swap it out with an apple instead. If you want a bit of tartness, go for a green apple, if you want something mellower, go with a red variety. Sick of acorn squash or can’t find it? Butternut squash, red kuri, or delicata would work. A kabocha squash will have a slightly sweeter taste, so if that’s what you’re looking for, go for it. 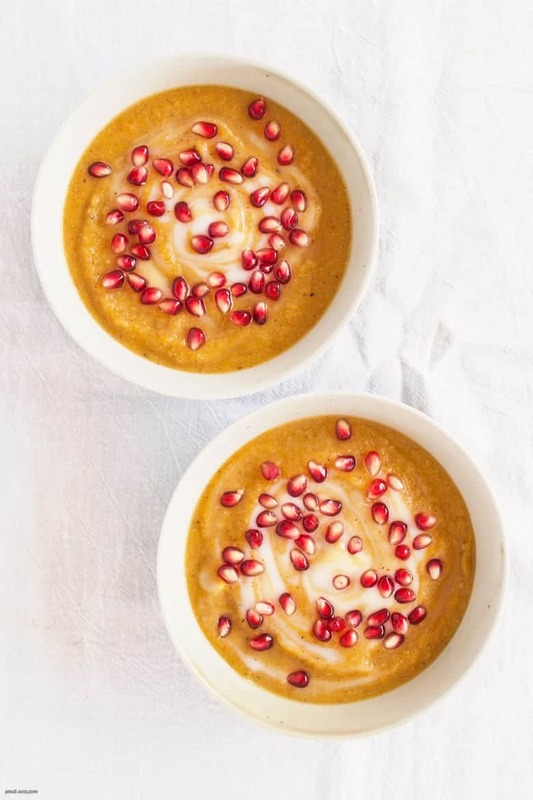 Any winter squash can work. I’ve given many options in the recipe for the kind of stock or broth you can use, I prefer a lower-sodium variety so I can flavor it with salt and other seasonings to my taste. For a beautiful garnish, flavor and hint of probiotics, I’ve added a dollop of coconut yogurt. If you can handle dairy, feel free to swap out with an organic, grass-fed variety, or skip it all together. I’ve also sprinkled pomegranate arils (that’s the name of the juicy seed pod that you eat) across the top for crunch and some pop. It’s helpful to add something to chew to activate your digestion more. You can add crunch in other ways as well, through hemp seeds, other nuts that are either coarsely chopped, in pieces, or silvered. If you’ve got some gluten-free croutons or can handle regular croutons, you could add that as well. Kale chips, honestly, would be a great crunchy addition. Whatever you’ve got at home that’s got some crunch that you want to add to the top, give it a try. This soup is easy to execute to make things easy for the rest of your life, so have fun with making it your own, cooking it, and enjoying it around your table. Preheat oven to 425. Place acorn squash halves onto a baking sheet or in a 13x9 baking dish. Drizzle coconut oil over the squash and season lightly with salt. On a baking sheet, arrange all the cauliflower florets and stalks in a single layer and drizzle with coconut oil, salt, and pepper. Roast both for 30 minutes, until fork tender. Allow squash to cool until easy to handle. Scoop squash flesh out with a spoon and into a stock pot. Add cauliflower into the stock pot and combine with stock, pear and seasonings. Bring soup to a warm temperature, then turn off the heat. If using an immersion blender, blend soup in stock pot until smooth. Add more stock or water until desired consistency is reached. If using a blender, pour the soup in the blender in batches and run until smooth and the desired consistency is reached. Adjust seasonings as needed. 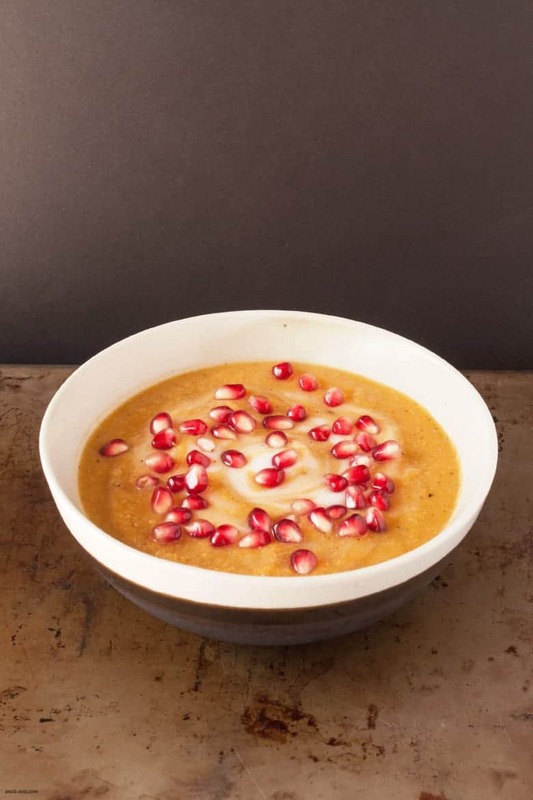 Portion into bowls and garnish with yogurt of your choice and pomegranate arils.